Are you a scholar? Would like to collaborate with peers on a global scale? Want to get your work noticed before peer reviewed publication? SSRN facilitates open access to cutting-edge scholarship, empowering authors to produce better research faster. Academic research papers are uploaded directly to SSRN by authors, reviewed by qualified classifiers and posted for worldwide readers to access and download. Once a paper is accepted for posting by the SSRN classifier team, the working paper is available to view online, worldwide. 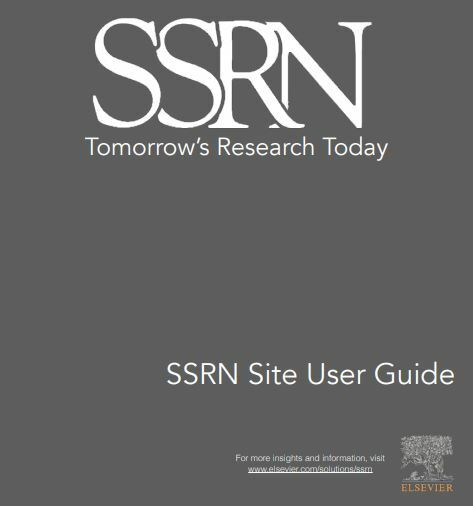 Want to learn more about how to use SSRN as a research tool? We’ve created a series of tutorial videos to help you learn quickly about the interesting features available on SSRN. With over 30 research networks with granular categories in each, you’ll find social, life, and physical science disciplines available to post your early-stage ideas, abstracts, working papers, and preprints. Number of New Papers: The number of full text papers that have been added to SSRN in the last 12 months. This figure includes papers that were written some time ago but have been recently uploaded. New Downloads Per Paper: A measure of the average number of downloads per paper in the last 12 months. Per paper statistics are counted only where an author has more than five publicly available papers available for download in the SSRN elibrary. Total number of Downloads: Total lifetime downloads for an author's publicly available full text papers. Total number of Citations: The total number of times an author's paper has been cited in other papers in the SSRN elibrary. Number of Papers: The total number of publicly available full text papers in an author’s SSRN e-library. With SSRN, scholarly research is at your fingertips. Why waste time searching online when you can search SSRN and read all about the latest research in your designated field of interest? An informative indicator of popular prepress and open access is SSRN’s ability to showcase author and paper rankings by the number of downloads. And, SSRN users can also subscribe to abstract email journals covering a broad range of subjects.